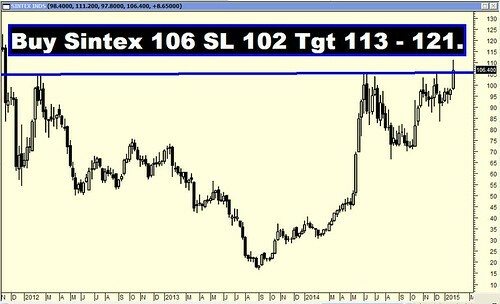 Archives : BULLS ON STEROIDS; BEARS IN ICU - 23/01/2015. BULLS ON STEROIDS; BEARS IN ICU - 23/01/2015. The current rally was expected and the Nifty was supposed to move towards the golden ratio target of 8893, but what is surprising is the speed at which the market is rushing towards achieving that target. If it was RBI which surprised the market last week, then this week it was the ECB’s decision which provided the bullish impetus to the market. As a result, the market is on its way to test the target levels as well as the resistance line which is the upper boundary of Broadening pattern. Sensex opened the week at 28249, made a high of 29408, low of 28197 and closed the week at 29278. Thus it closed the week with a strong gain of 1157 points. At the same time the Nifty opened the week at 8550, made a high of 8866, low of 8531 and closed the week at 8835. Thus the Nifty closed the week with a gain of 322 points. On the daily charts, Nifty opened with a gap up on Friday and formed a small white body Spinning Top whereas the Sensex formed a small white body candle with an upper shadow. On the weekly charts, both Sensex and Nifty have formed a big Opening White body Marubuzo. Thus daily as well as weekly candlestick study suggests continuation of bullishness in the near term. Both the indices completed a Symmetrical Triangle pattern last week and are now moving towards achieving pattern target of Sensex 30076 and Nifty 9030. Also both the indices are within striking distance of the golden ratio target of Sensex 29554 and Nifty 8893. Also both the indices are very close to the upper boundary of the Broadening Rising pattern which is at Sensex 29685 and Nifty 8911. This upper boundary which is a Rising Trendline has been providing resistance to the indices for the last seven months. 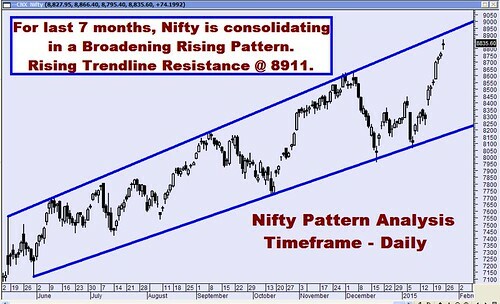 Thus both the indices are likely to be tested at the Target zone of Sensex 29554-30076 and Nifty 8893-9030. Both the indices formed a weekly Upward Gap between Sensex 28197-28194 and Nifty 8531-8530 which will not only act as immediate support but also this can be termed as a Measuring Gap. The target as per the Gap hypothesis comes at Sensex 29922 and Nifty 9100, provided both the indices continue to stay above this weekly gap. MACD and Price ROC are both positive and continue with their Buy signal. Interestingly RSI (73), Stochastic Oscillator %K (97) and MFI (80) are all overbought. It indicates that there can be reaction in the indices and one has to be cautious. ADX has moved higher to 25, suggesting uptrend is gaining strength. Directional Indicators continue in Buy mode as +DI remains above –DI. OBV and Bollinger Band continue in Buy mode. Thus certain Oscillators are overbought suggesting one has to be cautious in the near term. Both the indices continue to remain above the short term average of 20dma (Sensex – 27847 and Nifty – 8403), medium term average of 50dma (Sensex – 27885 and Nifty – 8383) and also the long term average of 200dma (Sensex – 26007 and Nifty – 7784). Thus the trend in the short term, medium term and long term timeframe continue to remain bullish. Option data suggest highest Put Open Interest is at 8000 whereas the highest Call build-up has shifted to the strike of 9000. Thus Option data suggests a wide trading range with support coming in at 8000 and resistance around 9000. On Friday, strong Put writing has happened at the strike of 8800, which suggests immediate support at that level.